One of Philly's most prominent juice hubs, Sip-N-Glo Juicery, just announced that they have jumped on the CBD bandwagon. 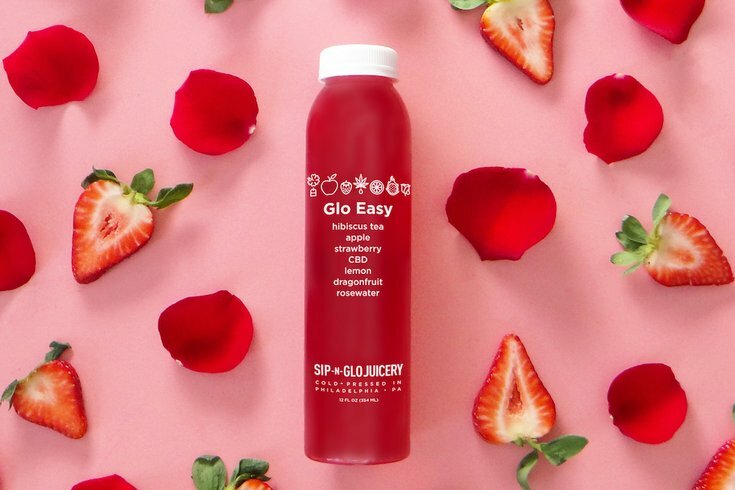 Their new product, Glo Easy, features 15 milligrams of non-psychoactive CBD, or cannabidiol, alongside strawberry, rosewater, lemon, apple, dragonfruit and hibiscus tea. The sweet strawberry is balanced by the tart lemon and rounds out with a lovely floral finish from the rosewater, hibiscus and, of course, the CBD. As you might already know since CBD, a cannabis compound, became a serious health trend this year. Derived from hemp, CBD helps regulate what is essentially the communication system from your brain to your nervous system to aid in creating calm, restorative energy and balance. There is evidence that it is helpful for lessening anxiety and pain. And CBD is an effective treatment for some forms of childhood epilepsy. The juice is fairly affordable – $8.95 for a 12-ounce bottle – when compared to Sip-N-Glo's other juices and smoothies and the cost of other local CBD edibles, like Little Baby's CBD-infused chocolate ice cream, which will set you back $20 for a pint. In the works for over a year, Sip-N-Glo's trendy new juice is the product of research – from visiting California dispensaries to evaluating the efficacy of the water soluble form used in their products. You can pick up a bottle of Glo Easy from Sip-N-Glo locations at 257 S. 20th St., 932 South St. and 1700 Sansom St.